Pleasure Point, Santa Cruz, California– About six feet of vertebrae fossils believed to be between 3 and 5 million years old were discovered by surfers crossing the beach below the wetsuit vanguard’s house when an unusually low tide exposed the specimen this month. Some are suggesting that it may be a dinosaur. 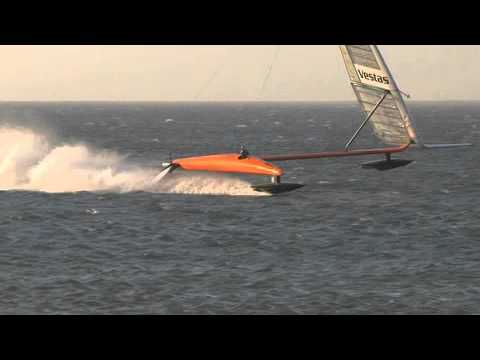 Working with 25-knot winds and calm seas off the coast of Namibia, Paul Larsen and the Vestas Sailrocket 2 team reached an (unofficial) average speed of 59 knots, or nearly 68 miles per hour, hitting a top speed of 68.01 knots per hour, or just over 78 miles per hour. Watch how much the hull begins to chatter with even just the slightest surface texture. … fresh off the TRIMBLE… 65.45 average 68.01 knots for 1 second. I am… speechless. Performance sailing has entered a new era. We did battle with speed-spot today and we came away friends. I could walk away from speedsailing today and say “job done”. Tomorrow… well, I’ll worry about that then. This is a special time. I’m glad we shared it here. Cheers, from us to you. Venice is experiencing, “acqua alta”, a seasonal period of high waters brought by rains and high tides. Here is a photo gallery of the city under water. 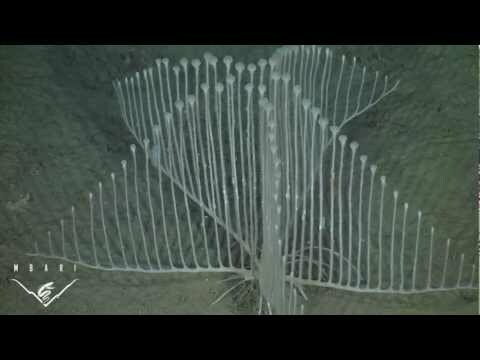 The newly discovered harp songe (Chondrocladia lyra), which hardly resembles any other sponge or carnivore, holds itself 10,000 feet beneath the surface using root structures called “rhizoids”. Like fan coral, it stands proud in the water column, protruding many vertical branches from its several horizontal “vanes”. The tiny balls at the tips of the branches are spermatophores, orientated to broadcast sperm. Also equipped with spurs, the branches extend upward like the strings of a harp creating a net to trap small crustaceans–the sponge’s primary prey.